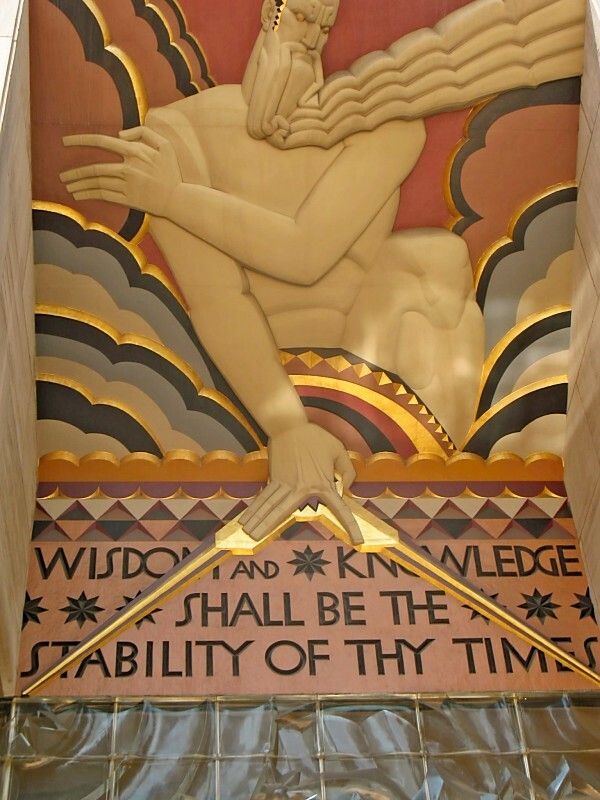 PHOENIX – U.S. District Judge Susan Bolton adjourned Thursday without giving any hint as to how she will rule on two separate motions seeking to prevent SB 1070 from becoming effective July 29. Bolton heard arguments from lawyers in two suits, as they sought preliminary injunctions to keep the anti-illegal immigration law, also known as the “Support Our Law Enforcement and Safe Neighborhoods Act,” from taking effect next week. Twice during the day, spectators filled the grand, circular courtroom on the second floor of the Sandra day O’Connor U.S. District Courthouse, 401. W. Washington St., in Phoenix. They huddled shoulder to shoulder, suit to suit as they filled about seven rows of seats in the courtroom as well as the entire observation rotunda above. Not a cell phone nor pager could be heard all day as lawyers, journalists, political officials and court personnel hung on every word exchanged between Bolton, the plaintiffs, and the defendants. The beating of drums and chanting of anti-SB1070 slogans by protesters outside, and the frequent honking from passing cars could not be heard once the courtoom doors were closed. Natural light from the opaque glass atrium that rose five stories above the couroom helped to keep attention focused on Bolton and her sharp questioning of the attorneys. The federal government sued the state two weeks ago, alleging Arizoan “crossed a constitutional line,” when it enacted SB1070. The Justice Department maintained in the suit that Arizona’s proposed law “conflicts and undermines,” national immigration policies. Plaintiffs in the morning hearing sought injunctions to prevent each of Arizona’s 15 county sheriffs and 15 county attorneys – all of whom were named personally in the suit – from using the new powers provided by 1070 to detain and investigate immigration status. Nina Perales, an attorney with the Mexican American Legal Defense and Education fund, sued the counties alongside the ACLU and National Immigration Law center, on behalf of over 20 humanitarian and non profit groups. “SB 1070 effectively criminalizes being here without permission. By failing to carry registration documents your subject to prosecution or jail time,” she told the court. Perales argued Sb1070 not only oversteps state jurisdiction in immigration enformcement but raises imminent threats to the safety of citizens and their civil rights. The feds can also sanction fines instead of deportation, afford asylum, or offer immunity in exchange with cooperation in other situations of national interests. The state of Arizona cannot deport citizens under SB1070. Perales said in a private interview after the hearing that the final version of the bill was broadened from its original wording to allow officers more situations in which to assess immigration status. “It’s all fair game now if it goes into effect,” she said. Racial profiling – basing traffic stops, detentions or arrests on a subject’s ethnicity – is generally illegal under federal law. The law does not provide any insight into acceptable measures of citizenship but training documents and video provided by the Arizona Peace Officer’s Training Board do list factors that can be considered in forming reasonable suspicion. Thomas Liddy, representing Maricopa County Sheriff Joe Arpaio (who was not present at the hearing), argued that the claims against the state and counties were inappropriate in federal district court. “The proper forum is for the Department of State and the U.S. Congress,” he said. Jadwat said Sb1070 poses a threat to civil rights and imminent harm because the language could extend to passengers in vehicles, witnesses to accidents, victims of crime, those seeking asylum or anyone who came into contact with an officer investigating any claim of any incident. Thursday afternoon’s hearing was part of a suit brought by the U.S. Department of Justice, which named Gov. Jan Brewer as the defendant. Justice asked the judge to keep SB 1070 from taking effect, rejecting the state’s claim that it merely wants to help enforce current immigration laws. U.S. Deputy Solciitro Edwin S. Keedler presented the case against Brewer, who was present for the hearing. According to keedler, Congress has never criminalized the mere presence of an undocumented person in the United States and left the ultimate discretion to enforce immigration law to the federal government as a way to balance competing interests. “The nation’s immigration laws reflect a careful and considered balance of national law enforcement, foreign relations, and humanitarian interests,” read the Justice motion for an injunction. Keedler did not raise any civil rights issues but maintained that Congress specifically allowed for a federal regulation of immigration to make sure that no state can cause disruptions in foreign relationsi. He argued instead that Arizona violated the supremacy clause of the Constitution, which specifically reserves immigration enforcement for the federal government. Keedler said the criminal statutes Arizona cited in SB1070 to establish its authority were intended to prosecute smugglers, not non-violent persons residing in the state without documentation. 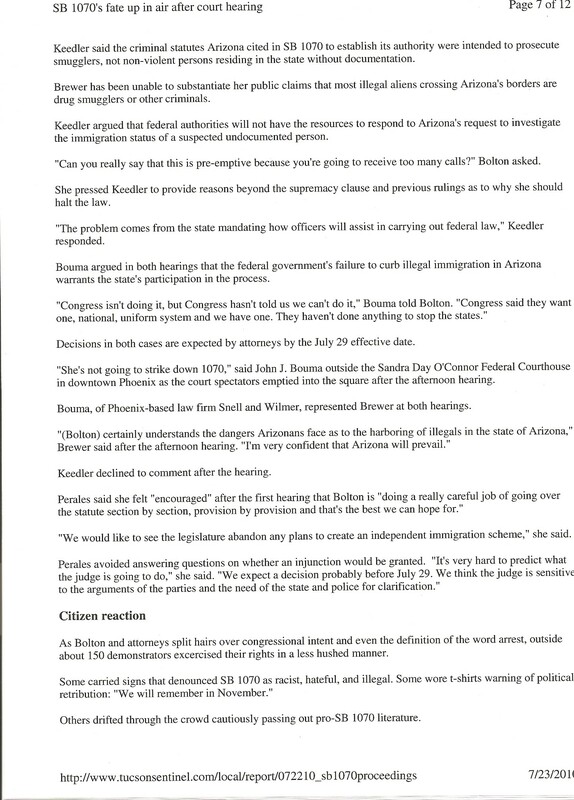 Brewer has been unable to substantiate her public claims that most illegal aliens crossing Arizona’s borders are drug smugglers or other criminals. 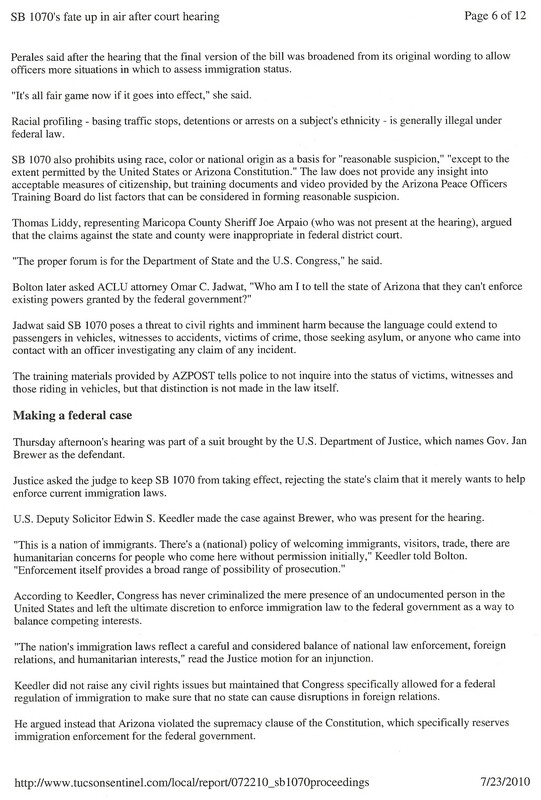 Keedler argued that federal authorities will not have the resources to respond to Arizona’s request to investigate the immigration status of a suspected undocumented person. “Can you really say this is pre-emptive because you’re going to receive too many calls?” Bolton asked. She pressed Keedler to provide reasons beyond the supremacy clause and previous rulings as to why she should halt the law. “The problem comes from the state mandating how officers will assist in carrying out federal law,” keedler responded. John J. Bouma of Phoenix firm Snell and Wilmer represented the state and Brewer. He argued in both hearings that the federal governments failure to curb illegal immigration in Arizona warrants the state’s participation in the process. 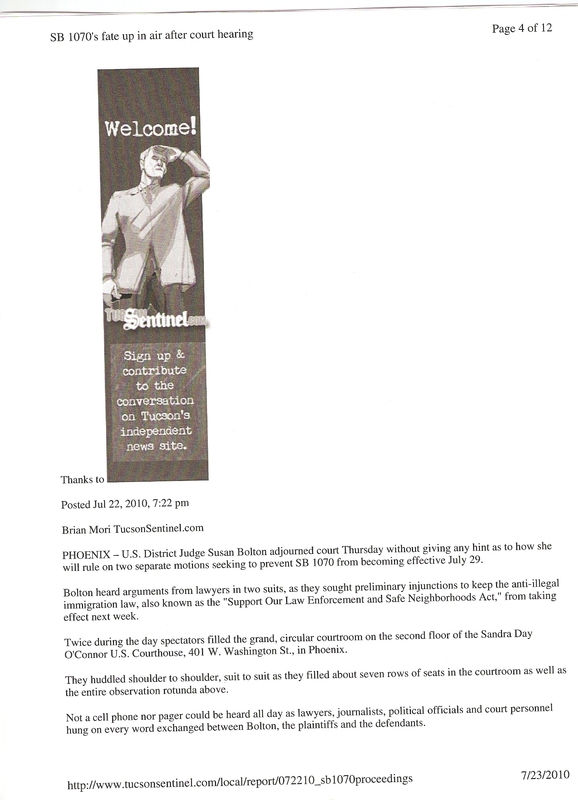 Decisions in both cases are expected by attorneys by the July 29 effective date. “She’s not going to strike down 1070,” said John J. Baoma, attorney for Brewer and the state. Keedler declined to comment after the hearing. “We would like to see the legislature abandon any plans to create an independent immigration scheme,” she said. As Bolton and attorneys split hairs over congressional intent and even the definintion of the word “arrest,” about 150 demonstrators outside the courthouse excesised their rights to express opinions in a less-subdued manner. Across Washington Street, ASU business student Bryan Berkland held up a sign supporting SB 1070. “All SB 1070 does is allow (the state) to enforce the current laws,” said Kelly Townsend, president of the Greater Phoenix Tea Party, before the morning hearing. Townsend co-founded the chapter with Les White, who compared the powers exgtended to police in SB 1070 to those of other countries around the world. “There is nothing unique about this,” White said. “We have no problem with people coiming her legally but the state of Arizona just can’t afford to be that generous anymore,” he said. White said he believe local law enforcement should be allowed to assess the immigration sattus of any person with whom they come into contanct in the normal course of their duties. “It’s a geographic issue that most of the people suspected of being an illegal alien will be from Mexico.” White said in reference to widespread claims that the bill effectively mandates racial profiling. Bolten was unavailable for comment following the hearing. Attorneys will be able to appeal any decisions to the 9th Circuit Court of Appeals in San Francisco. Brian Mori – Tucson Sentinel. CLICK ON THE IMAGES TO READ THE ORIGINAL PUBLISHED STORY, though I reccomend reading the typed version above for a purer version. 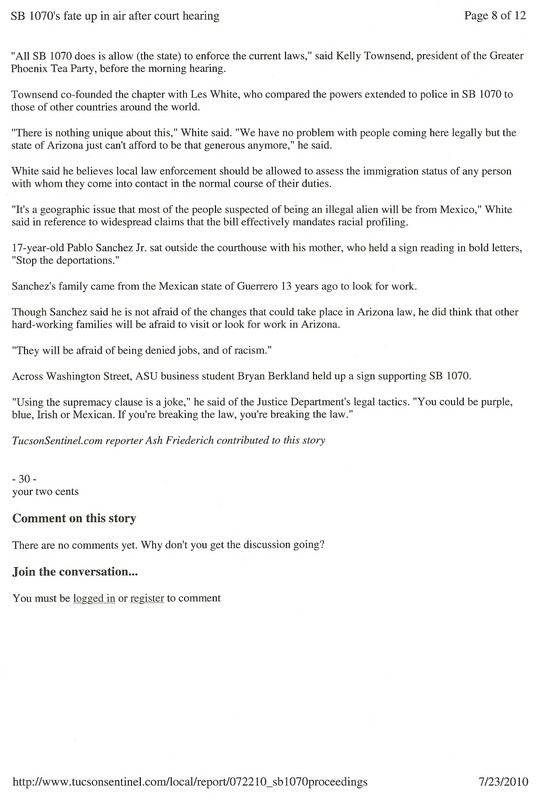 Tucson Sentinel’s Dylan Smith was invaluable cleaning, and fitting the story for publication but was not up-to-date on changes that had been made to SB1070 before the hearing in Phoenix. By the time the bill made it to court, Senate Committees inserted requirements which required “reasonable suspicion,” for officers to investigate a person’s legal status. Smith insisted on excluding this information. SMITH WAS NOT IN COURT, I was.